University of Delaware faculty members with expertise in each of the six areas of study that had winners of this year’s Nobel Prizes will discuss the significance of the winners’ work beginning at 7 p.m., Wednesday, Oct. 25, in the Harker Interdisciplinary Science and Engineering Laboratory. The program, which is free and open to the public, is designed for non-specialists, with students, staff, faculty and community members encouraged to attend. The annual event will consist of six short talks and an opportunity for the audience to ask questions. Sponsored by the College of Arts and Sciences, the lecture will be held in Harker Lab’s first-floor commons area. 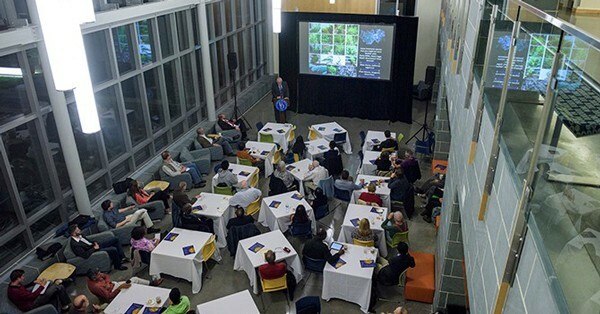 The series of talks is held each year as a way to give interested members of the UD community and the public more in-depth information about the Nobel laureates’ research than is found in general news stories about the prizes. The speakers are faculty members who conduct research and scholarship in areas closely connected to the prize-winning work. Veronique Petit, assistant professor of physics and astronomy, will speak about the Nobel Prize in Physics, which was awarded to Rainer Weiss, Barry C. Barish and Kip S. Thorne for their “decisive contributions to the LIGO [the collaborative Laser Interferometer Gravitational-Wave Observatory] detector and the observation of gravitational waves,” according to the award announcement. Juan Perilla, assistant professor of chemistry and biochemistry, will describe the work done by Jacques Dubochet, Joachim Frank and Richard Henderson in developing cryo-electron microscopy. They won this year’s Nobel Prize in Chemistry for the technology, which allows researchers to generate three-dimensional images of the molecules of life.